Mark Leviste - A Customer Service Star is Born! Mark Leviste changed franchises and countries — from the Philippines to Canada — where he is the go-to guy for ServiceMaster Clean of Edmonton, Alberta. 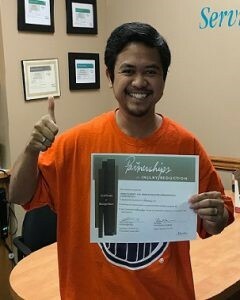 It took one year, 7,000 miles and one 12-hour flight to get Mark Leviste from ServiceMaster Clean in the Philippines to ServiceMaster of Edmonton in Alberta, Canada. Now, three years later, Mark is an award-winning customer service ace in the business owned by Cara Smith. Mark spent almost six years working for the ServiceMaster Clean licensee in the Philippines. When he and his wife, Carmie, decided to move to Canada, she went first. Under Canadian immigration law, Mark had to wait one year while Carmie worked and became a supervisor at her job. Meanwhile, Ding Doplayna, Philippines general manager, contacted Donna Infurchia, director of international support and franchise relations in Memphis, who sent Mark’s resume and Doplayna’s recommendation on to Edmonton. Mark arrived in Edmonton and joined Smith’s business in 2015. Customer service rep is born! Mark’s ability to solve problems, work with customers, keep them happy and, as Smith says, “assume nothing,” make him a natural and a great fit at ServiceMaster Clean of Edmonton.